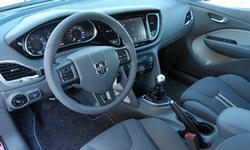 I've already reviewed the new2013 Dodge Dart once this year. I liked some things about the Alfa Romeo Giulietta-based (not so) compact sedan, but overall felt that it was "hard to make a compelling case" why someone should buy one. Car buyers have generally agreed with my assessment. The Dart has not sold well. A more powerful engine and better-tuned suspension could help, anda Dart R/T powered by an all-new184-horsepower 2.4-liter four-cylinder engine was supposed to arrive just a few months after the other trim levels. None ever reached dealers. Instead, Dodge canceled the DartR/T and announced that they'd instead offer a Dodge GT. The GT is exactly what the R/T would have been, just with a price about $1,700 lower. According to the officialline, this switch was just a way to re-price the car once it became painfully clear that car buyers weren't interested in a Dart much more expensive than the Limited. Butdid Dodge also have second thoughts about whether the car's performance warranted an R/T label? And, with 2013 Dart GTs only reaching dealers on the heels of some 2014s, in July,why the ten-month delay? Good luck finding the answer to these questions. But we can try to answer another: Is the Dart GT good enough to warrant a second look from car buyers? GT's red bits liven the place up. 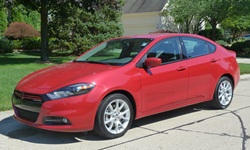 To reduce the Dart GT's price of entry, Dodge could have truncated the R/T's standard features list. Instead, the GT has everything the stillborn R/T would have had. Which is everything the Limited has, plus the Premium Group (heated leather seats, heated steering wheel, dual-zone automatic climate control, Homelink, remote start) and a distinctive "Racetrack" tail light. On top of this, the GT also has satellite radio standard. Options include a Technology Group chock full of features not widely available in an affordable compact sedan (proximity key, rain-sensing wipers, auto-dimming headlights, and a bevy of collision warning systems), HID headlamps, sunroof, nav, a powerful Alpine audio system, and "hyper black" wheels like those on the tested car. No direct competitor offers more features. Most offer much less. And this is before we consider the no-cost option of "header orange" paint. An 8.4-inch display for Chrysler's Uconnect infotainment system fills the upper part of the center stack. With large, well-spaced, and logically organized virtual buttons, this system is considerably easier and less distracting to use than the latest flagship systems from Ford and General Motors. It's the best touchscreen-based interface in the biz. You don't have to rely on the touchscreen or voice commands for basic audio and HVAC adjustments. Partly because they aren't needed for minor adjustments, the conventional knobs and buttons at the base of the center stack are refreshingly limited in number. They're large and logically arranged, and so are easy to operate at a glance. Or even by feel alone. Raked shoulder leads to high rear deck. But the rear window isn't reduced to a mail slot. Controls and displays the easiest to use in the industry. Neither of the Darts I'd driven previously (an SXT and a Limited) made me swoon. Their interiors seemed a bit drab and dated (especially the SXT's). Their exteriors seemed, if not also dated, at least bedeviled by an overly long nose. Inside the GT, Dodge took all of the interesting details from the Limited (upholstered instrument cluster hood, piano black trim, a lighted ring around the upper instrument panel at night), and added a bunch of red bits: door pulls, stitching, even the perforations in the bolsters of the black leather seats. These details help make the Dart GT's interior more visually exciting than that of any direct competitor. A chunky steering wheel hub and bulbous, Pontiac-like lower center stack remain, but in the GT interior I found myself more willing to overlook these. With its plentiful faux timber, the Buick Verano's interior appears much more "mature." I've often said that large, five-spoke alloy wheels can make just about any car look better, and the GT's set has transformed the Dart's exterior appearance. With them, the car's nose no longer appears disproportionately long. Instead, the fenders seem barely able to contain the large wheels. The whole could hardly be more clean. "Dated" has become "timeless." Perhaps even in orange, which suits the Dart GT's shape surprisingly well. We return to the footsteps of the previous review. Fitting the Dodge Dart with lower profile tires and a firmer suspension has made it little if any louder. Thanks to features like triple door seals, the Dart sounds even quieter inside than a Chevrolet Cruze or Ford Focus. The Buick Verano is a little quieter still, but it's not a direct competitor. This said, the new 2.4-liter is the rare four-cylinder engine that sounds best (by far) at high rpm. It idles with the clatter of a Honda reject, switches over to a fart can gurgle at low rpm, then unexpectedly transitions to a much more pleasant (if somewhat synthetic-sounding) vroom when wound out. In its defense, this engine is never loud (not even near the redline) and you'll hear little from it while cruising. For the Dart GT, Dodge adds the larger engine and $1,700 worth of options to the Limited, yet only charges $1,000 extra for it. So even with a base price just under $22,000 it's clearly a much, much better value than the Limited. Thanks to this aggressive pricing, the Dart GT also undercuts a Ford Focus Titanium with automated manual transmission, handling package, and nav by $1,155, $24,230 vs. $25,385. (Add another $895 to either car for a sunroof.) The Dart has a torquier engine and more of a big car feel, while the Focus feels more agile, gets considerably better fuel economy, and has more comfortable front seats. An argument could be made that the Ford's advantages are worth another $1,155. But "$1,155 cheaper" requires much less 'splanin. Those who buy their compact sedans by the inch and pound will find the Buick Verano a closer match. In terms of features, a $27,640 Verano with its Leather Group is equipped much like a $24,235 Dart with its Technology Group (the Buick packages safety nannies with leather). The Buick has fewer interior bits of questionable quality. But is this worth $3,405? Wondering about another comparison? Head to the pricing area of the site. The changes for the GT have changed a few areas from "why nots" to "whys." I also didn't mind the deep instrument panel and limited steering wheel adjustment as much this time around. In a back-to-back drive, the instrument panel on the Focus seemed even deeper than the Dart's. If you're tall, you might feel like you're sitting too high in the Dart. I acclimated. But the larger engine didn't help fuel economy. The EPA ratings fall from the 2.0's already marginal 24 mpg city, 34 highway to 21/30. (Or from 25/36 to 23/33 if you're comparing cars with manual transmissions.) The Buick manages 21/30 even with its optional turbocharged engine--and received a "why not to buy" for this. These days, most midsize cars do better, and most compacts do much better. In our real-world driving the Dart GT's trip computer reported less dreadful numbers, at least in the suburbs. When the GT was driven with little care for fuel economy, the trip computer reported averages in thelow to mid 20s. With a light foot it reported averages in thelow 30s. In one fairly long highway trip, though, the trip computer verified the EPA number with an average just over 30. This new engine employs FIAT's "multiair" throttle-free intake system, allegedly good for a seven-percent fuel economy bump. As with the 1.4T engine, though, this technology has little evident benefit in the EPA's tests or real-world driving. Note: for 2014, Dodge has improved the Dart GT automatic's EPA ratings from 21/30 to 23/35. They did this partly by substituting the taller final drive ratio from other Darts, so the 2014 GT won't be as quick. The Dart's front seats look great. But, partly because of how they're styled, they don't feel great. Thickly padded, slightly concave center panels are separated from widely-spaced bolsters by a deep, wide groove. With my average adult male build (5-9, 165 lbs. ), I didn't feel any support from the bolsters, only the slightly raised edges of the center panels and then the absence of support from the bordering groove. If you have a broadertorso, you might find them more agreeable.Still, just about anyone will likely prefer the better-shaped buckets in the Focus. GT has a black grille. Tighter than the exterior size suggests it ought to be. The Dart's door open and close with a satisfying sense of solidity. This carries over to much of the car. Which makes the bits that feel a little light or clunky (the automatic shifter, those easy-to-use knobs) stand out like sore thumbs. A little more polish would go a long way inside this car. The Dart's generous size pays few dividends in its back seat, where legroom, though a bit more abundant than in the Focus, is in shorter supply than inside some other smaller, lighter competitors. The average adult will fit behind the average adult with a little room to spare. The seat itself isn't quite as comfortable as the higher, larger, better-shaped cushion in the Focus. I made it all the way through the "whys" and "why nots" without commenting on what the Dart GT is like to drive. Which is an improvement over the Dart Limited. The problem isn't that the Dart GT is boring to drive. It's actually a fair amount of fun. The problem is that, even with the substantial improvement provided by the GT tweaks, some competitors remain more fun. With regard to handling, the specs aren't favorable. Generous dimensionas, sound deadening, and a cornucopia of features all add weight. Toss in a bigger engine, automatic transmission, and larger wheels, and the tested Dart GT, at a Verano-like 3,348 pounds, is heavier than the average midsize sedan, and far heavier than the average compact. Moderately heavy steering, though quicker than average, reassuringly accurate, and nicely weighted, effectively communicates these extra pounds. With 300-plus fewer pounds to contend with and quicker, lighter steering, the Ford Focus feels considerably more agile. Maybe agile handling isn't your thing anyway. Maybe you like the solid, planted, well-damped feel of a well-tuned midsize car, and have been seeking this feel in a (modestly) smaller package. Well, here it is! Aided by a retuned suspension complete with mechanically adaptive dampers, the GT better maintains an even keel over swells, dips, and broken pavement than other Darts. In hard turns, it leans and plows considerably less. It's an easy, enjoyable car to drive quickly. The GT suspension tweaks don't only benefit the Dart's handling. The GT also rides better, quickly and firmly--but not harshly--dispatching bumps and divots with little impact on the car's composure. The suspension still crashes over some of these, but less often and less severely than the Limited. The Ford Focus also rides well, though with a firmer-yet-lighter character. The Buick Verano, with a more similar size, weight, and mission, feels more similar to the Dart. But, assisted by the GT's aural and visual cues, the Dodge feels sportier and is more involving than the Buick. While the GT's 2.4-liter engine is more powerful than the Dart's other two options, it's not much more powerful, 184 vs. 160 horsepower. On paper, the 2.4 isn't even as strong as the 1.4T through the midrange (peak torque of 171 lb-ft at 4,800 rpm vs. 184 lb-ft at 2,500 rpm). But in real-world driving the 1.4T feels soft south of 3,000 rpm. Even in casual driving the 2.4 feels stronger. In a sub-3,000-pound car, 184 horsepower would do nicely. In a 3,348-pound car, it's merely adequate for moderately spirited driving (which might explain the R/T's stillbirth). But the 2.4 performs much better than the Dart's other engines, and also has an edge over the strongest engine available with a self-shifting transmission in the Focus, a 160-horse 2.0-liter. The Verano is another matter. Its base engine is as large and as strong as the Dart's. Buick realized this wouldn't be sufficient for some people, so a 250-horsepower turbocharged 2.0-liter is on the options list. Dart fans have been wishing for a similar option from Dodge. You can get the GT with either a manual or a manually-shiftable automatic transmission, both with six ratios. If the manual transmission is like that paired with the 1.4T engine, then its shifter feels clunky and its clutch engages too high off the floor. The automatic transmission bumps about more than it ought to, but performs full-throttle shifts with a satisfying quickness and firmness. The periodically truncated exhaust note when running hard through the gears resembles some much stronger, much more expensive machinery. In both how it looks and how it drives, the Dodge Dart GT is a big improvement over its sibs. Though the larger engine and retuned suspension don't transform the Dart into a switchback-mastering pocket rocket, they do make it much moreenjoyable to drive. The five-spoke 18-inch wheels are apparently what the exterior has been lacking, while red details add a healthy dose of visual excitement to the interior. Other strengths are carried over from other Darts. The controls are among the best in the entire industry. And you'll be hard-pressed to find another car that feels as solid or includes as many features for the price. So, why not buy a Dart GT? Unfortunately front seat comfort hasn't improved, while fuel economy has gotten even worse. But if these things don't affect or bother you, and you find the Dart GT's strengths attractive, then you know where to go. Larger engine, but boring cover. Trunk is more competitive. Rear seat folds and includes a pass-through. Dodge provided an insured car for a week with a full tank of gas. Bob Bucknum at Suburban Ford in Waterford, MI, helpfully provided the comparison car. He can be reached at 248-674-5626.